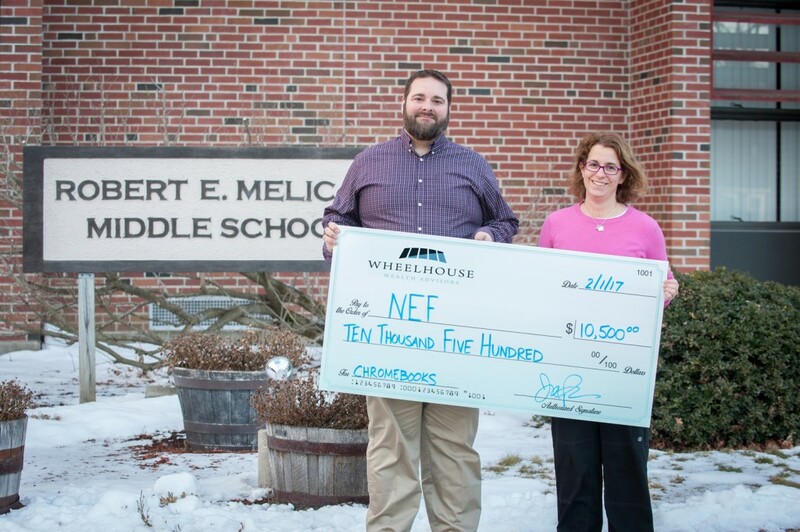 NEF is thrilled to announce that, thanks to the extreme generosity of local residents and businesses alike, we have reached our goal of raising $50,000 for the purchase of more than 200 new Chromebooks for Northborough’s K-12 schools. The NEF Chromebook Campaign was launched on April 1st of 2016 with a live “paddle raise” at our annual Team Trivia Night. The paddle raise brought in over $8000 to kickstart the campaign. In the year following, NEF has received donations from individuals and families in Northborough, “Evenings for Education” hosts, and a number of local businesses including T. Rose Karate (who donated 100% of proceeds from an Intro to Karate fundraiser), Central One Federal Credit Union, Liquid Ice, Northboro House of Pizza, Emily Jane Designs and LulaRoe. The largest donations came in from several campaign sponsors who generously contributed 10 or more Chromebooks to the campaign. These include: Wheelhouse Wealth Advisors, The Staples Foundation, Haven Restoration and the Northborough Chiropractic Center. NEF wishes to thank all those who helped us to realize our goal. Thanks to your generous support, Northborough students will have much greater access to the technology they need to propel their literacy and achievement in 21st century skills.